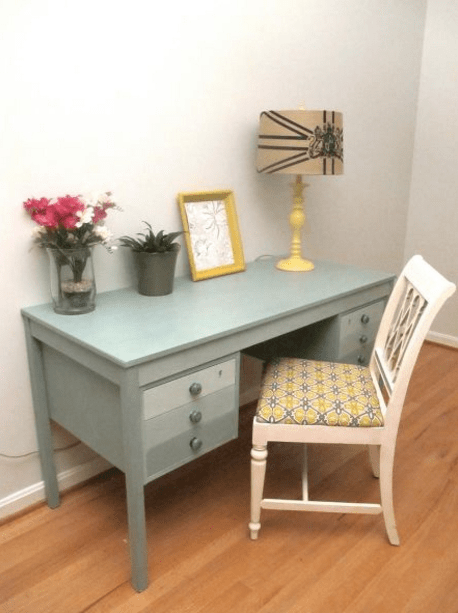 You are here: Home / Thrift Talk / Thrift Haul / The $500 ReStore Dresser, Oh My! The other day I stopped at the ReStore because I was looking for a vanity light for my half-bath (I’ll be posting that next week!). I don’t stop in there much because their prices are higher than my beloved Value Village. But I’m glad I did stop because not only did I get to see some really great stuff, but it was also a reminder about why I love making over old furniture. I believe I literally gasped, then grabbed my phone and posted a picture of it on my Thrift Diving Facebook page. I had to tell someone immediately. I mean, this thing was sooooo sweet. I expected to see ugly innards–the classic sign of beat-up old furniture that fell into the hands of a DIYer with vision. Inside was just as fresh and green as the body! In fact, it looked factory-finished. You could tell it hadn’t been hand-painted. No–this either did come from a factory, or someone with a very professional paint gun did this piece. And they were going to make you pay the price for this quality. Can we say “sticker shock”?? 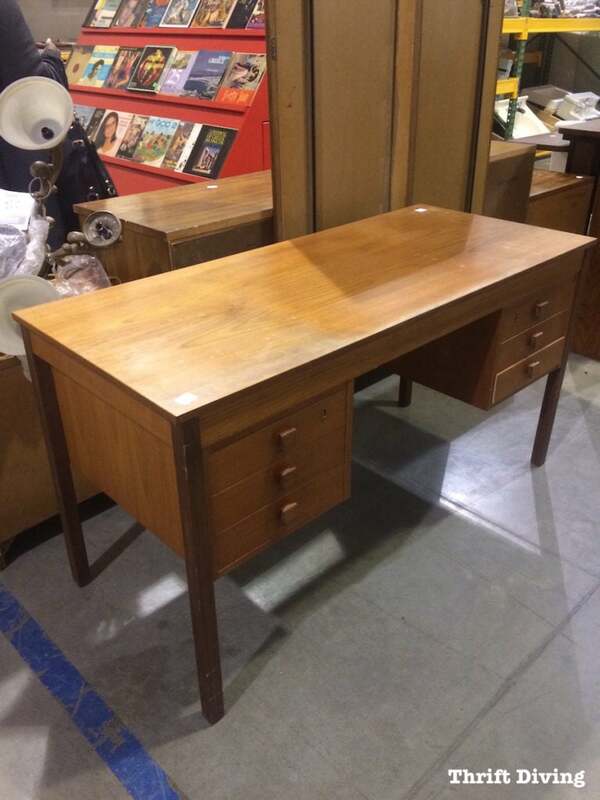 But that desk had only cost me $12 to buy from the thrift store. 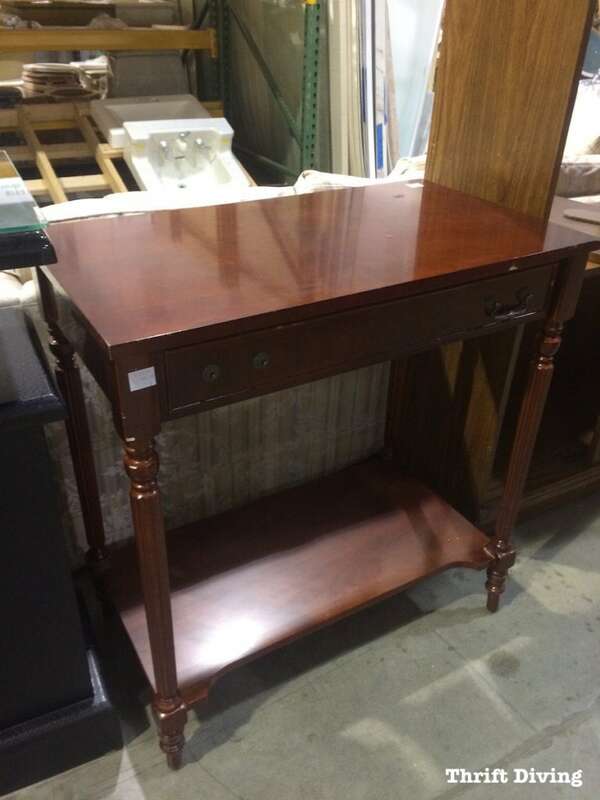 I just couldn’t see myself paying $550 for that dresser. Not when I know that I could pull off the same look for much less. 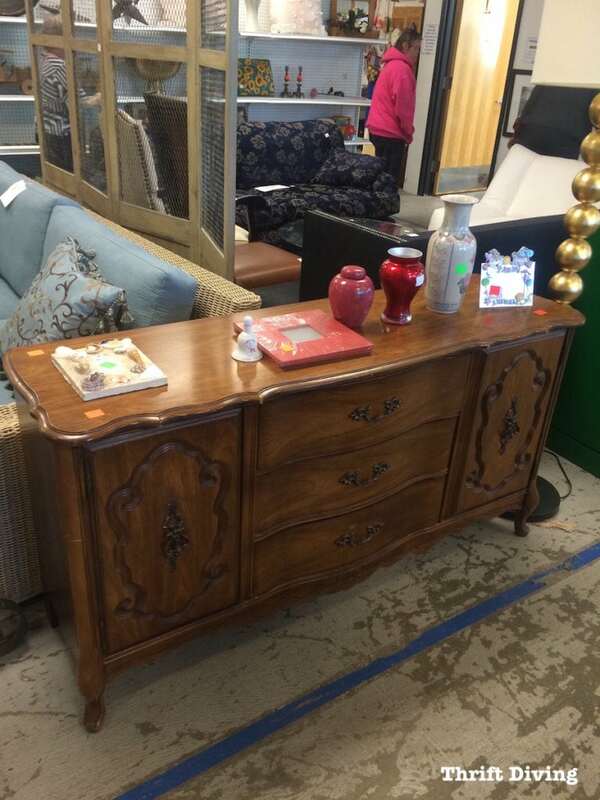 And sure enough, when I went in back to the other furniture, I saw this pretty dresser in its discarded demeanor. 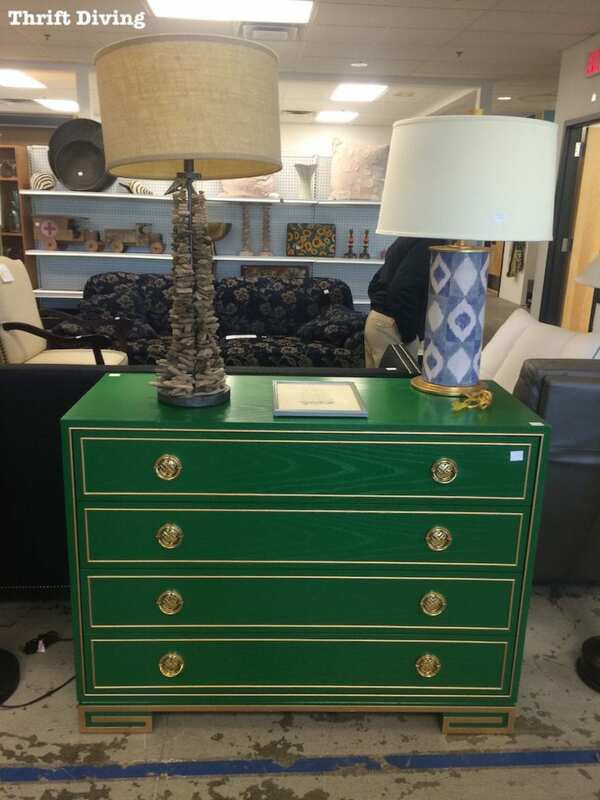 It reminded me of the $550 green and gold dresser! But for much cheaper: $90! If you’re willing to buy UGLY, you can find a dirty piece with essentially the same design elements and similarities to the expensive version and achieve nearly the same look for so much less! And this was a good piece, too. Inside it had a Genuine Mahogany guarantee, which was pretty cool! 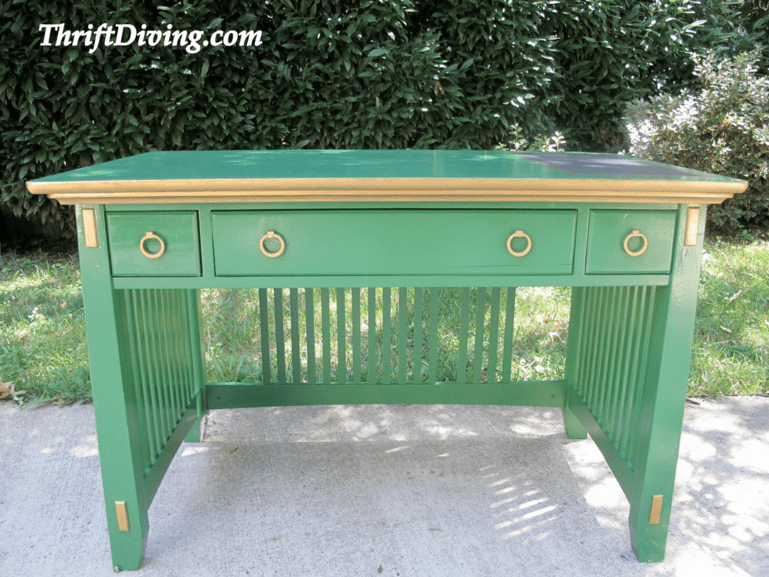 While I was there I also saw this desk that’s an exact replica of my “dumpster desk” I painted a few years ago that I had found next by the trash when we lived in our condo years ago! 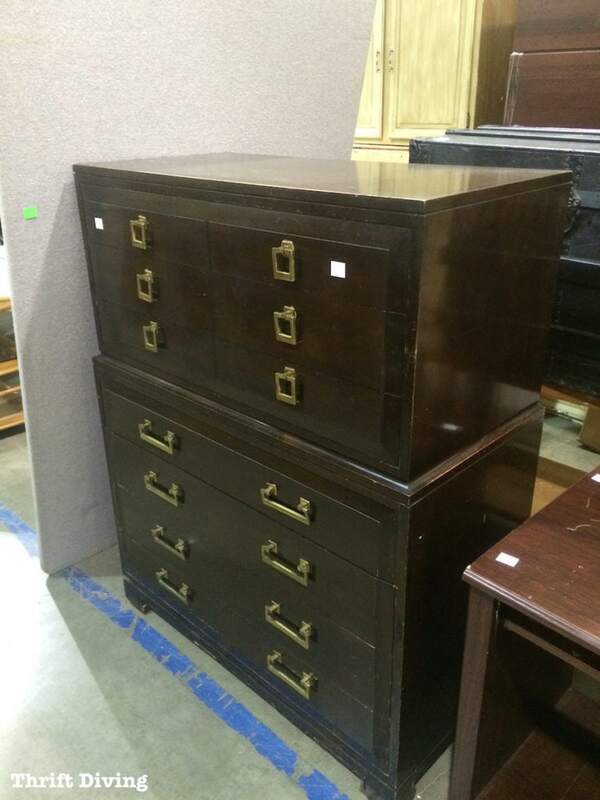 This one was $85, but it was much more sturdy than mine. I wish I could have bought it! My “dumpster desk” doesn’t look this good anymore. The kids have broken off several glass knobs, and well, that’s about how most things end up in this house with three rambunctious boys. HAHA! (If you have boys, you understand…..). 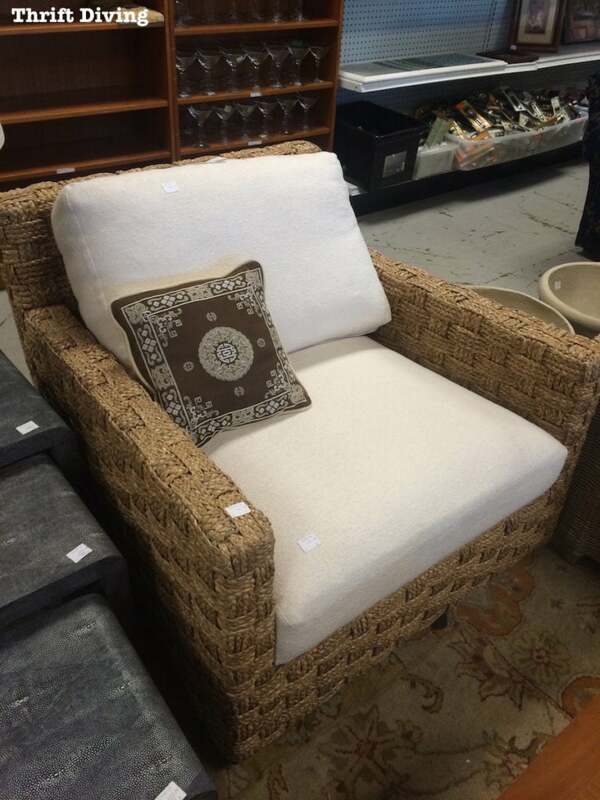 If it had been reasonably priced, I would have swooped it up, for sure! Couldn’t you imagine this as a little coffee and tea station in your kitchen?? Drooling again…..
And, of course, you know they had designer prices. I believe all of these pieces were in the $400 – $500 range. 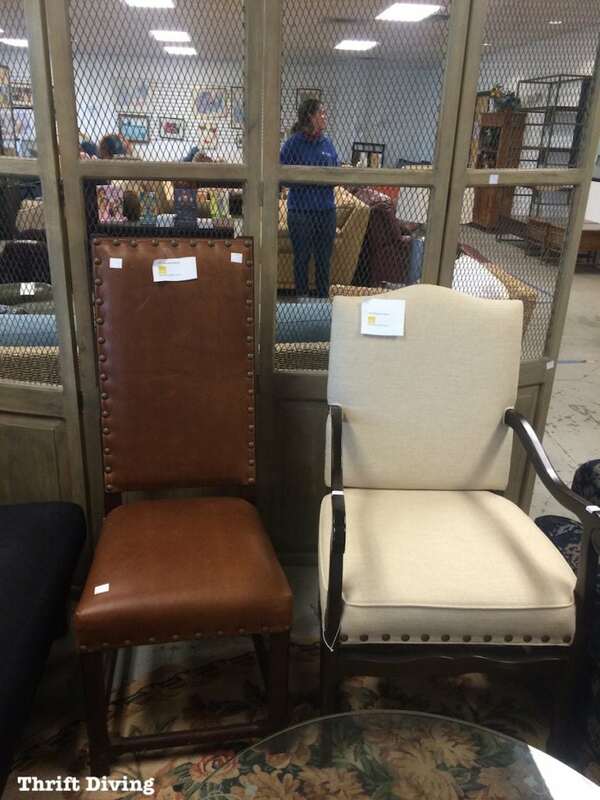 These chairs were marked pretty high, too. …..and this screen right behind the chairs! I loved how rustic it looked and how solid it was build. It was just under $500. EEK! 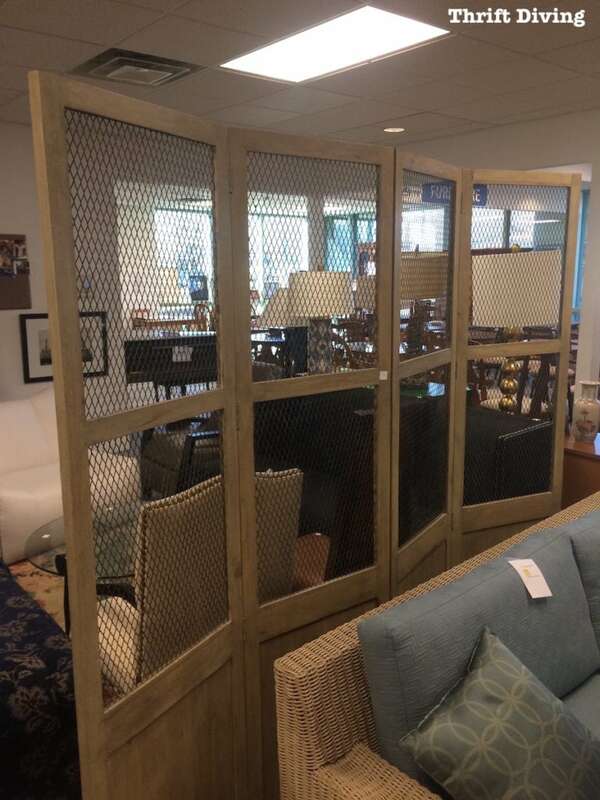 But this would look amazing to section off a large room! And I do know that these are designer pieces. What seems expensive to us could actually be pretty affordable if it had cost thousands brand new! So I guess we have to keep that in perspective, right? Some of the more reasonably priced stuff was cute, too. 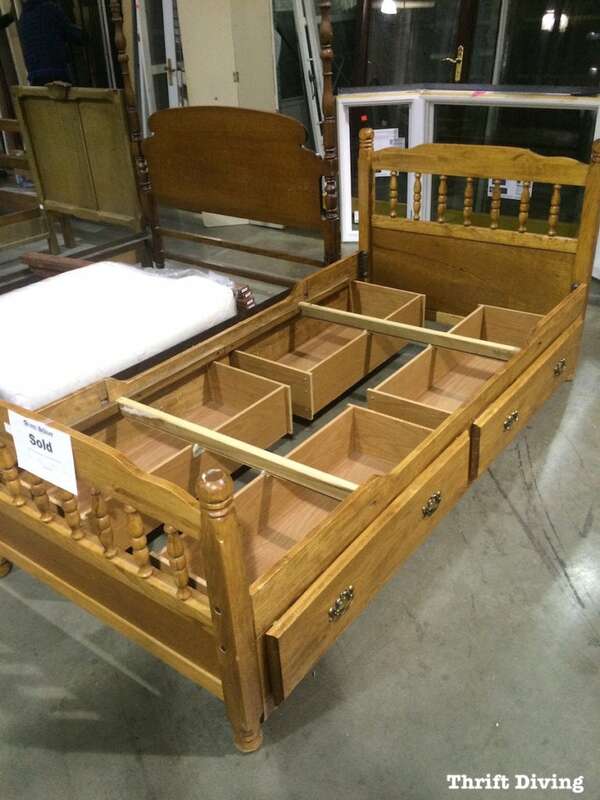 I love, love, love beds that have drawers underneath! I think this buffet was $90, and even was 25% off of that. This could be beautiful painted! I ended up finding these little craft caddies in the back of the store, only $10 each! Looks like they had been donated from the local retirement community! I bought one of them because I’m planning to offer furniture painting classes here in the Maryland, DC, Virginia area again soon, and it would be soooo helpful to have something to tote to and from class. This is perfect! 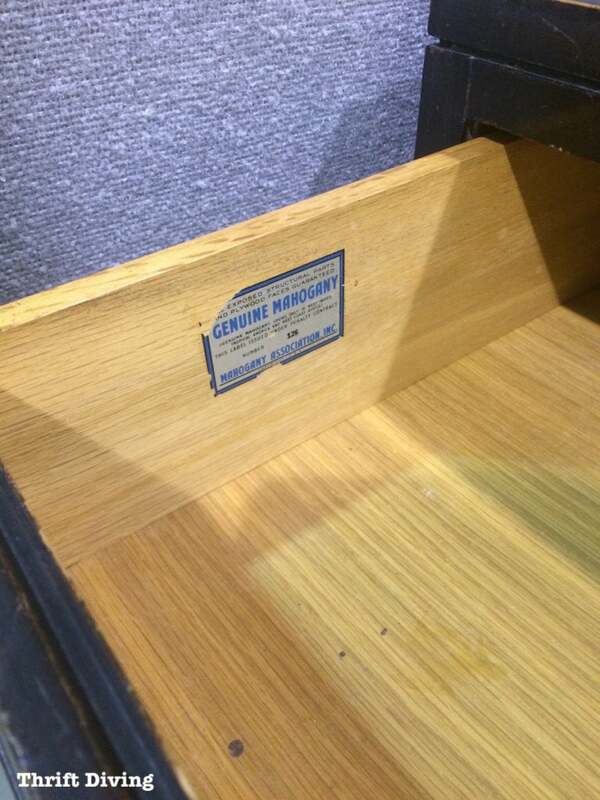 And one of my favorite spots at the ReStore is the scrap wood and trim section! 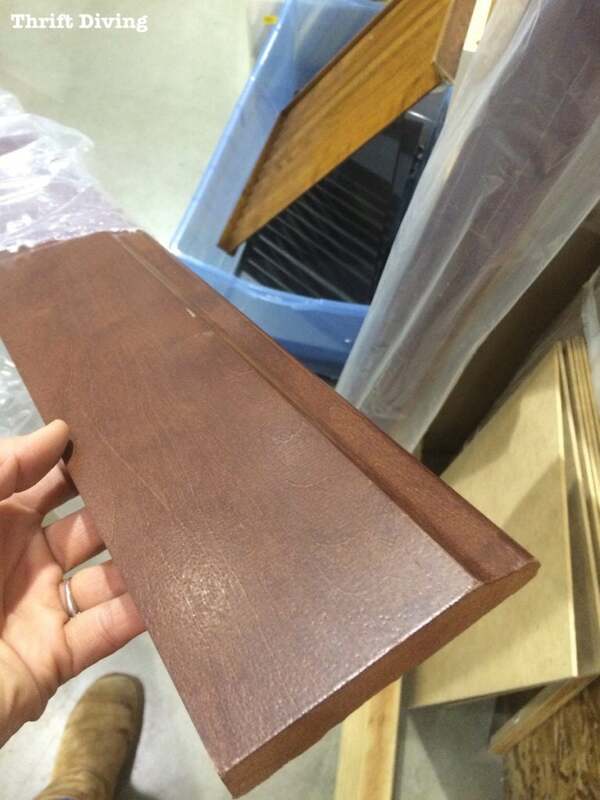 I found 16 feet of mahogany base molding for $8 total! They were wrapped in their original plastic and I peeled it back to show you guys how amazing this stuff was. Trust me–I checked online and an 8-foot piece usually costs $35 – $40. But each of my pieces were only $4. These would be perfect for a small bathroom or maybe to even repurpose into some other creative project! 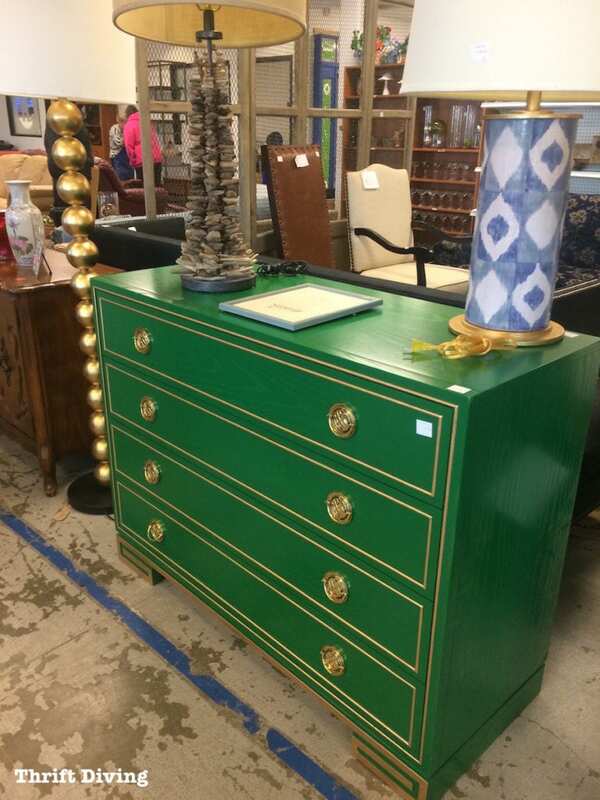 That green dresser was a mouth dropper all right. Both sticker price and the beauty of it. NICE!!! 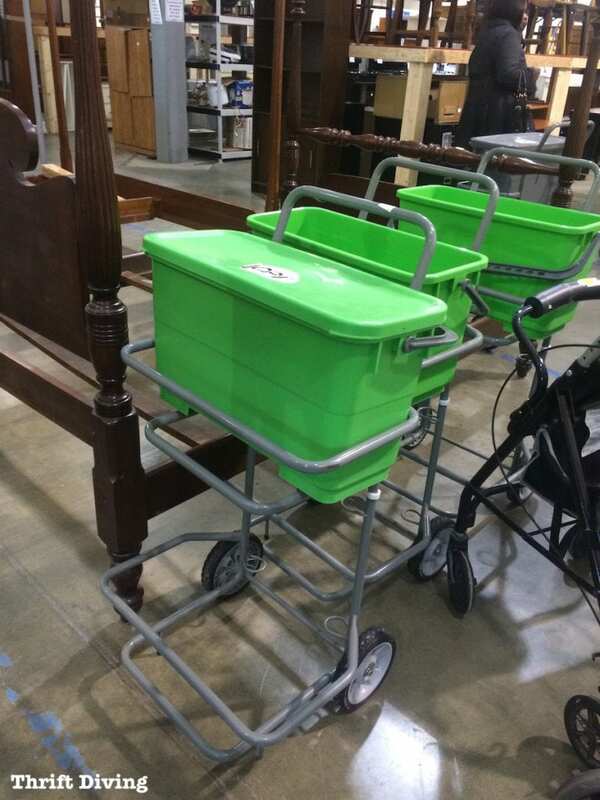 I love those little caddies, would have loved one, if it at my re-store. Nope cause I was just there this past Sat. for some nice espresso wood look tile. Love it. I have some pieces that I purchased at my local thrift store and some are painted and others are not. Honestly it was a lot of work. Although, the paint with primer says sanding is unnecessary I have had the best results with those pieces I took the time to sand first. What do you suggest? And what paint product you prefer? Hey, Bredigette! What type of paint are you using? I have a bunch of furniture paints that I love! 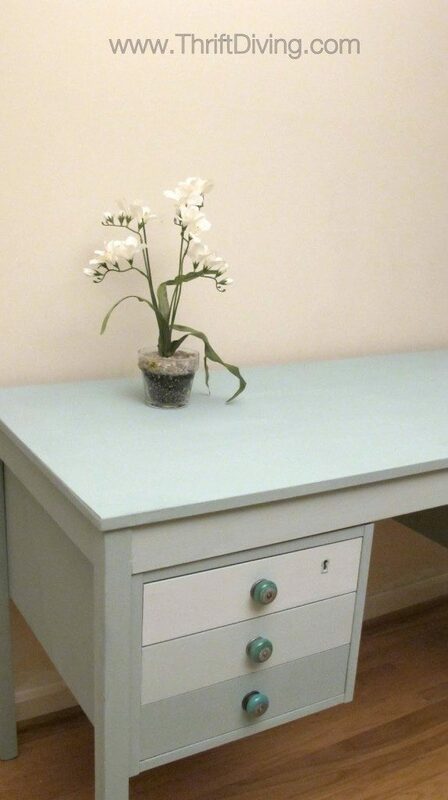 In fact, I wrote a post about it and you can see read my thoughts about each of the ones I have tried here: https://thriftdiving.com/whats-the-best-paint-for-furniture/. I’m really loving Amy Howard at Home chalk paint right now!! Hey Serena, I often see both designer and great solid pieces that are consider ugly to those without a DYI vision to imagine what the same piece would be cleaned up or painted in my local thrift stores. But on occasion I wonder what was the store thinking when they priced this beauty??? Reality sinks in pretty quickly and it dawns on me and I have to chuckle “they know the same thing I do; “its a designer gem priced very affordably compared to its original cost and in great shape”. Still I wish some of those pieces were in my price range of nearly free LOL! wow! those prices are outrageous. Nice, stuff, but not worth those prices. that little cart for $10 was a great deal. Gee, we were in the Restore yesterday up here in BC and they had a few nice vanity lights. We went in looking for a single kitchen cabinet and a pantry cupboard. We found our one cupboard for $25 but no pantry. Our Value Villages up here don’t carry furniture anymore and that is a real shame as other thrift stores usually only have overpriced or junk. I love the floor lamp that was placed next to it. $500 is ridiculous for a second hand store. I wonder if they are open to bargaining? Such an awesome store. Please feel free to take us through there again! I raised two boys myself, so yeah, “This is why we can’t have nice things!” I’m reminded of a long-ago co-worker whose two boys actually sawed the legs off of an easy chair while the parents were otherwise distracted! Boys! As usual, another great post!